First, allow me to apologize, because this is going to be a fairly long post. I've given this topic a lot of thought, and even experimented with concepts and previous implementations. This Loot Table was more of a "List". Basically, I would loop through each item, test it's probability, and if it was succesful, I would add it to a list of drops. This worked well in theory, but I was quick to notice a fatal flaw in the system. So what's happening now? We have essentially built a roulette system. Instead of a direct collection of LootTableItems, we now defer items into independent collections. LootTableLists. Each list has it's own probability, much like my original LootTable, but now we can successfully organize items into their own "pool" within a single LootTable. 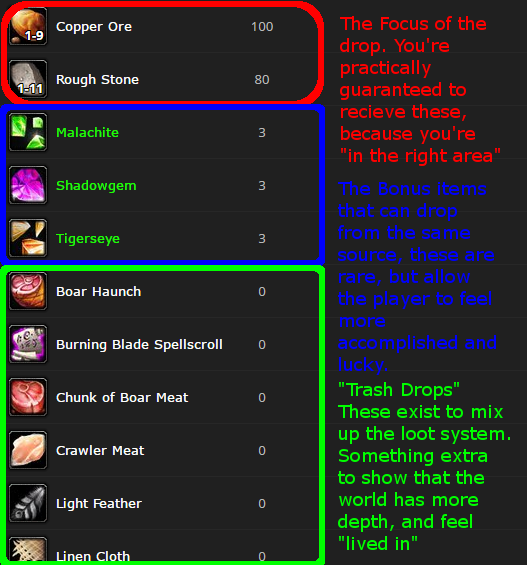 If we want an item to be less rare than another, we just add extra instances to the desired LootTableList. Then, when my LootTable is running it's algorithm, it selects one item from the LootTableList. This is great, but it also brought up another issue. What if I wanted all items in a LootTableList to be dropped, or have a chance of dropping? Well, I went ahead and added an extra field, called CollectAll. When this field is checked, it avoids picking one item, and instead picks all items in the LootTableList. 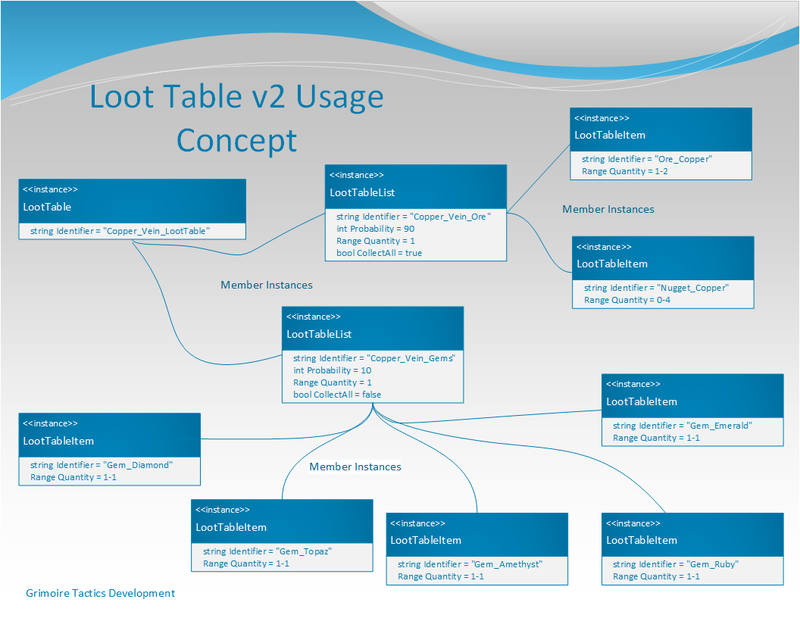 Is there a better and more modern conceptual foundation that I could use to achieve this kind of loot table? Are there any game developers on this site that have created Loot Tables of this nature? I just want to know if I could improve my concept, not just the code, but the concept itself. I'm certain there is more that can be done to improve upon my work. I'm just looking for advice from people experienced in this subject. I can also post my implementation into a separate project if it would help people help me. In fact, I think I'm going to work on that right now actually. Just realized I forgot to code the Quantity count in the LootTableLists, which if coded, would allow a LootTableList to be collected from multiple times during the same drop. You are on the right track. That is where I would start. All of your components share the identifier and quantity. It makes sense to add chance property and use composite pattern. 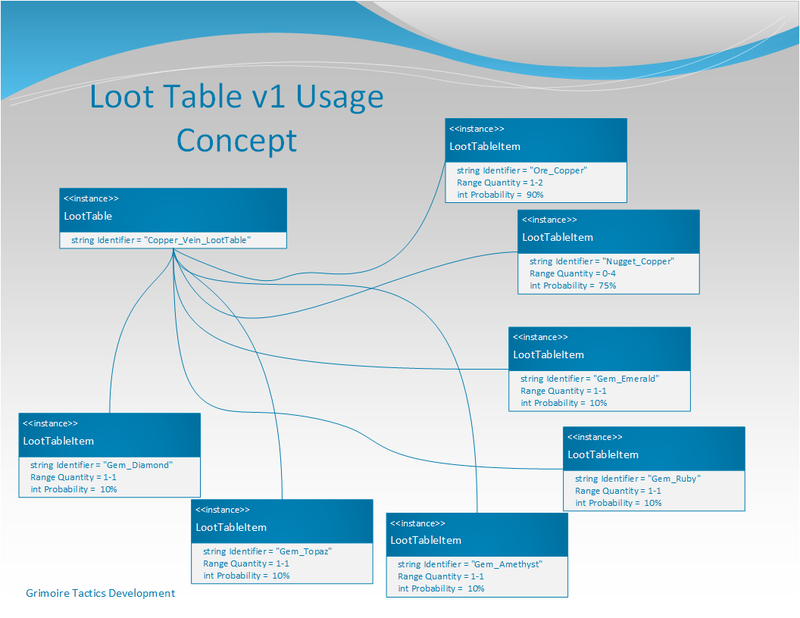 You can then create your loot table extending Droppable component. 20% of finding a chest (CompositeItem) that can have 10% chance of finding a coin (CompositeItem) which can be either gold, silver or copper, etc. All of those scenerios are then possible without changing dependency tree too much. The only thing you have to remember is obviously implement randomisation and keep in mind that sum of chances of nested droppables should be 1 (100%) for simplicity sake. Another great advantage of using composite pattern is ability to later on use that implementation for data you can dynamically read from static XML (or JSON) file. Not the answer you're looking for? Browse other questions tagged game-design game-mechanics or ask your own question. Designing Drops system - How and where chance of drops are defined? How should I store a large number of rooms with objects in them? How can I reward dungeon masters that take risks?